15 Brownieside Coal Co. Ltd West Cameron No 2 P.C.M. 18 Dunlop, J. & Co. Ltd. Cardowan L.C.G. 10 Forrester, R. & Co. Ltd Balmore (In Stirlingshire, not in production in 1939, but now in operation) L.C.G. 11 Garscube Colliery Co. Ltd. Garscube L.C.G. 13 Nimmo, J. & Co. Ltd. Auchengeich L.C.G. 12 Nimmo, J. & Co. Ltd. Wester Auchengeich L.C.G. 22 Carnbroe Coal Co. Ltd. Carnbroe P.C.M. 47-49 McAndrew, J. & Co. Ltd. Thankerton P.C.M. 41-42 Russell, Archd. Ltd. Tannochside P.C.M. 45 Bairds & Scottish Steel Ltd Bothwell Castle Nos 3 and 4 P.C.M. 46 Bent Colliery Co. Ltd Hamilton Palace P.C.M. 63 and 64 Dixon, Wm. Ltd. Blantyre P.C.M. 38 Flemington Coal Co. Ltd. Coats Park P.C.M. 39 Flemington Coal Co. Ltd. Gateside P.C.M. 40 Moore, A. G. & Co. Ltd. Blantyreferme Nos 1 and 2 P.C.M. 40 Moore, A. G. & Co. Ltd. Blantyreferme No. 3 P.C.M. 43 Summerlee Iron Co. Ltd Bardykes P.C.M. 89 Coltness Iron Co. Ltd. Douglas L.C.G. 84-87 Dixon, Wm. Ltd. Auchlochan L.C.G. 91 Douglas Glebe Coal Co. Ltd. Glebe P.C.M. 92-93 Kennox Colliery Co. Ltd. Kennox P.C.M. 90 Wilsons & Clyde Coal Co. Ltd. Douglas Castle P.C.M. 69 Coltness Iron Co. Ltd. Branchal P.C.M. 70 Coltness Iron Co. Ltd. Houldsworth P.C.M. 79 Coltness Iron Co. Ltd. Overtown P.C.M. 71 Coltness Iron Co. Ltd. Royal George P.C.M. 76 Darngavil Coal Co. Ltd Skellyton P.C.M. 77 Darngavil Coal Co. Ltd Telfer P.C.M. 50a Glasgow Iron & Steel Co. Ltd Coursington (not in production in 1939, but now in operation) P.C.M. 68 Glasgow Iron & Steel Co. Ltd Dalzell & Broomside P.C.M. 50 Glasgow Iron & Steel Co. Ltd Parkneuk P.C.M. 78 Hopefield Coal Co. Ltd Hopefield P.C.M. 82 Nimmo, J. & Co. Ltd. Canderigg Nos. 4 and 5 P.C.M. 83 Nimmo, J. & Co. Ltd. Canderigg Nos.6 and 7 P.C.M. 66 Russell, Archd. Ltd. Ferniegare P.C.M. 67 Russell, Archd. Ltd. Ross P.C.M. 80 Shotts Iron Co. Ltd. Castlehill P.C.M. 81 Wilsons & Clyde Coal Co. Ltd. Woodside P.C.M. 24 Coltness Iron Co. Ltd. Dewshill (ex. Duntilland) (not in production in 1939, but now in operation) P.C.M. 26 Coltness Iron Co. Ltd. Hassockrigg P.C.M. 72 Coltness Iron Co. Ltd. Kingshill No. 1 L.C.G. 73 Coltness Iron Co. Ltd. Kingshill No. 2 L.C.G. 74 Dixon, Wm. Ltd. Wilsontown L.C.G. 25 Garscube Colliery Co. Ltd. Hirstrigg P.C.M. 52 Shotts Iron Co. Ltd. Baton P.C.M. 54 Shotts Iron Co. Ltd. Calderhead P.C.M. 51 Shotts Iron Co. Ltd. Fortissat P.C.M. 53 Shotts Iron Co. Ltd. Hillhouserigg P.C.M. 55 Shotts Iron Co. Ltd. Northfield P.C.M. 58 Shotts Iron Co. Ltd. Southfield P.C.M. 56 and 57 Shotts Iron Co. Ltd. Stane & Kepplehill P.C.M. 3 Bairds & Scottish Steel Ltd Gartshore Nos. 3 and 12 L.C.G. 4 Bairds & Scottish Steel Ltd Gartshore Nos. 9 and 11 L.C.G. 2 Bairds & Scottish Steel Ltd Twechar No. 1 L.C.G. 6 Cadzow Coal Co. Ltd. Dullatur L.C.G. 5 Cadzow Coal Co. Ltd. Wester Gartshore L.C.G. 8 Callendar Coal Co. Ltd. Policy P.C.M. 9 Nimmo, J. & Co. Ltd. Redding P.C.M. 17 Bairds & Scottish Steel Ltd Easton L.C.G. 33 Bairds & Scottish Steel Ltd Riddochhill L.C.G. 60 Barr & Thornton Ltd. Fauldhouse No. 1 P.C.M. 16 Coltness Iron Co. Ltd. Woodend P.C.M. 32 Dixon, Wm. Ltd. Polkemmet L.C.G. 34 and 35 Forrester, R. & Co. Ltd Whitrigg L.C.G. 36 Forrester, R. & Co. Ltd Whitrigg No. 6 L.C.G. 94 Scottish Oils Ltd. Baads L.C.G. 30 Summerlee Iron Co. Ltd Benhar P.C.M. 27 United Collieries Ltd. Blackrigg P.C.M. 37 United Collieries Ltd. Foulshiels L.C.G. 31 United Collieries Ltd. Greenrigg P.C.M. 61 United Collieries Ltd. Loganlea L.C.G. 28 United Collieries Ltd. Netherton (in Lanarkshire, not in production in 1939, but now in operation) P.C.M. 62 United Collieries Ltd. Woodmuir L.C.G. 6 Carron Company Carronhall P.C.M. 7 Plean Colliery Co. Ltd. East Plean L.C.G. 5 Carron Company Bannockburn L.C.G. 1 Manor Powis Coal Co. Ltd. Manor Powis L.C.G. 2 Russell, Archd. Ltd. Polmaise Nos. 1 and 2 (Millhall Pits) L.C.G. 3 Russell, Archd. Ltd. Polmaise Nos. 3 and 4 (Fallin Pits) L.C.G. 11 Caddell, H. M. Bridgeness L.C.G. 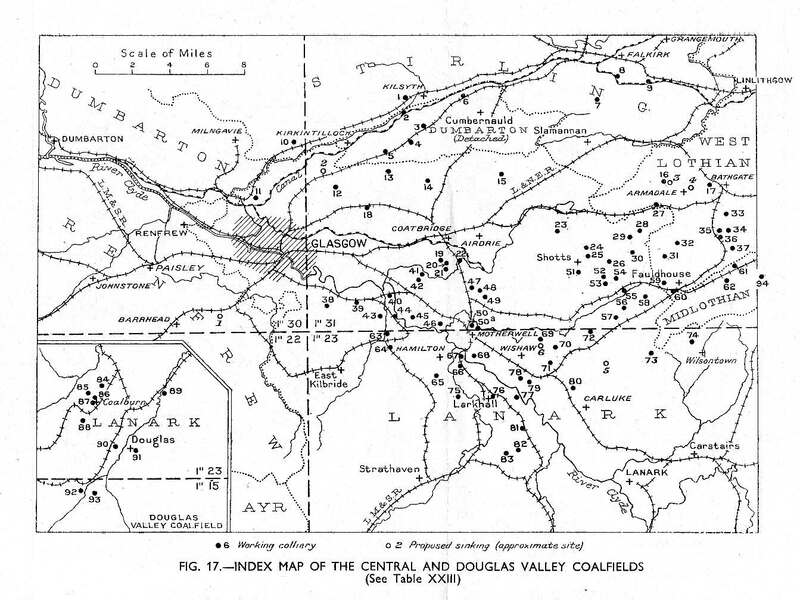 9 Kinneil Cannel & Coking Coal Co. Ltd. Kinneil L.C.G. 2 Alloa Coal Co. Ltd. Devon (and Meta) P.C.M. 3 Alloa Coal Co. Ltd. Tillicoultry (and Melloch) P.C.M. 4 Alloa Coal Co. Ltd. Zetland P.C.M. 5 Alloa Coal Co. Ltd. Craigrie (The Craigrie and Tulligarth pits were worked in 1939 by the Tulligarth Coal Co. Ltd.) P.C.M. 6 Alloa Coal Co. Ltd. Tulligarth (The Craigrie and Tulligarth pits were worked in 1939 by the Tulligarth Coal Co. Ltd.) P.C.M. 7 Fordel Mains (Midlothian) Colliery Co. Ltd. Brucefield P.C.M. 10 Fife Coal Co. Ltd. Valleyfield L.C.G. 9 Coltness Iron Co. Ltd. Blairhall L.C.G. 11 Alloa Coal Co. Ltd. Isle of Canty L.C.G. 12 Ness, Henry & Co. Ltd. Muircockhall L.C.G. 13 Kingseat Co. Ltd. Dean L.C.G. 14 Earl of Buckinghamshire Lady Anne L.C.G. 15 Earl of Buckinghamshire William L.C.G. 16 Earl of Buckinghamshire Alice L.C.G. 17 Fife Coal Co. Ltd. Mossbeath L.C.G. 18 Fife Coal Co. Ltd. Kirkford (pumping) L.C.G. 19 Fife Coal Co. Ltd. Cowdenbeath No. 7 L.C.G. 20 Fife Coal Co. Ltd. Lumphinnans No. 1 L.C.G. 21 Fife Coal Co. Ltd. Lindsay L.C.G. 22 Fife Coal Co. Ltd. Aitken Nos. 1 and 2 L.C.G. 23 Fife Coal Co. Ltd. Lumphinnans Nos. 11 and 12 L.C.G. 32 Lochgelly Iron & Coal Co. Ltd. Little Raith (Dora) L.C.G. 25 Fife Coal Co. Ltd. Bowhill L.C.G. 26 Fife Coal Co. Ltd. Kinglassie L.C.G. 27 Wilsons & Clyde Coal Co. Ltd. Glencraig L.C.G. 28 Lochgelly Iron & Coal Co. Ltd. Lochgelly (Nellie) L.C.G. 29 Lochgelly Iron & Coal Co. Ltd. Minto Nos. 1 and 2 L.C.G. 30 Lochgelly Iron & Coal Co. Ltd. Dundonald L.C.G. 31 Lochgelly Iron & Coal Co. Ltd. Jenny Gray L.C.G. 34 Fife Coal Co. Ltd. Randolph P.C.M. 35 Fife Coal Co. Ltd. Wellsgreen P.C.M. 36 Balgonie Colliery Co. Ltd. Balgonie P.C.M. 37 Wemyss Coal Co. Ltd. Lochhead P.C.M. 38 Wemyss Coal Co. Ltd. Michael P.C.M. 39 Wemyss Coal Co. Ltd. Rosie P.C.M. 40 Wemyss Coal Co. Ltd. Wellesley P.C.M. 2 Niddrie & Benhar Coal Co. Ltd. Woolmet P.C.M. 15 Moore, A. G. & Co. Ltd. Dalkeith L.C.G. 3 Moore, A. G. & Co. Ltd. Dalkeith Nos. 4, 5, and 6 P.C.M. 3 Moore, A. G. & Co. Ltd. Dalkeith Nos. 8, 9, and 10 P.C.M. 4 Lothian Coal Co. Ltd. Polton (pumping) P.C.M. 12 Lothian Coal Co. Ltd. Newbattle collieries L.C.G. 6 Gilmerton Colliery Co. Ltd. Gilmerton L.C.G. 11 Arniston Coal Co. Ltd. Arniston L.C.G. 13 Fordel Mains (Midlothian) Colliery Co. Ltd. Edgehead L.C.G. 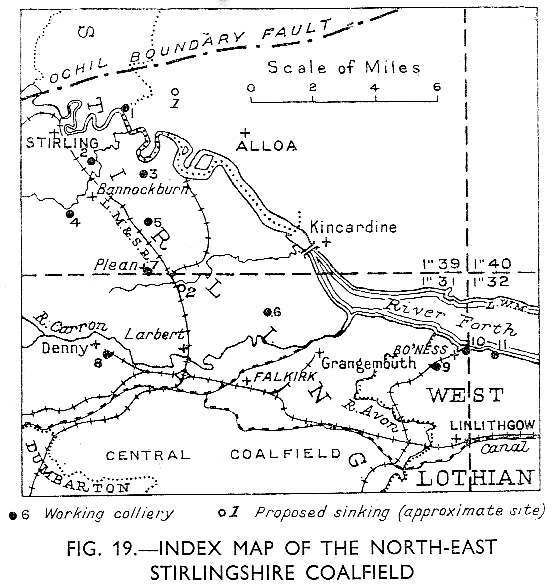 14 Fordel Mains (Midlothian) Colliery Co. Ltd. Fordel Mains L.C.G. 7 Shotts Iron Co. Ltd. Ramsay L.C.G. 8 Shotts Iron Co. Ltd. Burghlee L.C.G. 9 Shotts Iron Co. Ltd. Roslin L.C.G. 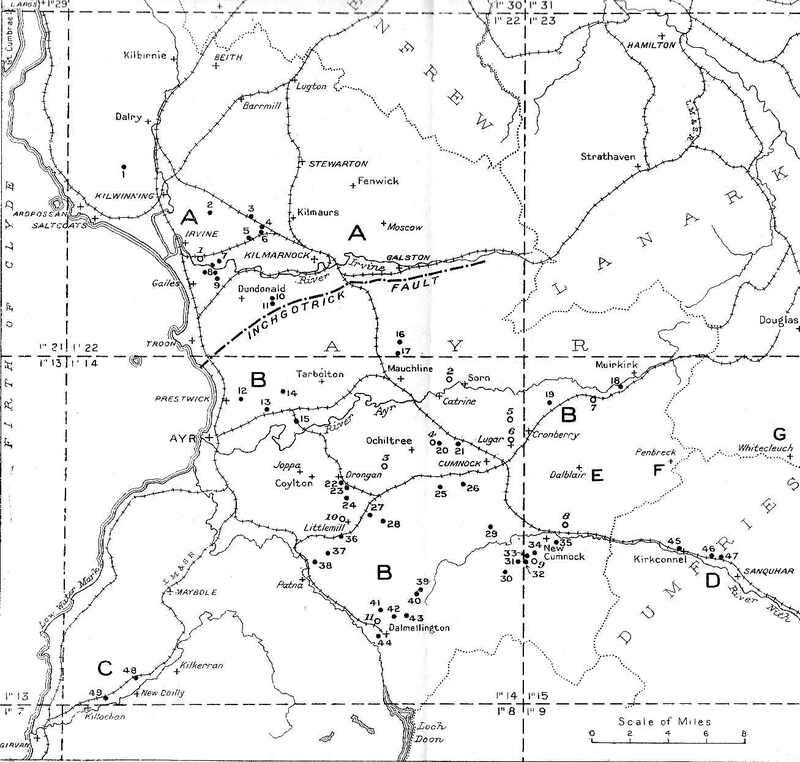 10 Cornton Coal Co. Ltd. Cornton L.C.G. 17 Edinburgh Collieries Co. Ltd. Wallyford (pumping) L.C.G. 19 Edinburgh Collieries Co. Ltd. Prestonlinks L.C.G. 20 Edinburgh Collieries Co. Ltd. Bankton (pumping) L.C.G. 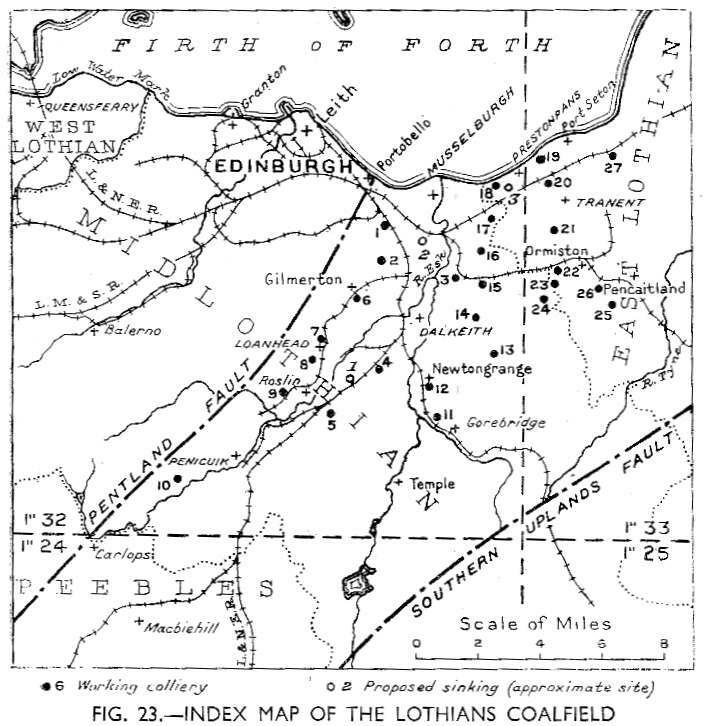 21 Edinburgh Collieries Co. Ltd. Fleets L.C.G. 18 Summerlee Iron Co. Ltd Prestongrange L.C.G. 22 Ormiston Coal Co. Ltd. Limeylands L.C.G. 23 Ormiston Coal Co. Ltd. Tynemount L.C.G. 24 Ormiston Coal Co. Ltd. Oxenford No. 2 L.C.G. 25 Gordon, William Penkaet L.C.G. 26 Woodhall Coal Co. Ltd. Pencaitland (now closed down) L.C.G. 27 Glencairn Coal Co. Ltd. Glencairn (not in production in 1939) L.C.G. 4 Howie, J. & R. Ltd. Busbiehead (small undertaking) P.C.M. 5 Howie, J. & R. Ltd. Muirside (small undertaking) P.C.M. 10 Kenneth, A. & Sons Ltd. Newfield Mines (new sinking just coming into operation) P.C.M. 7 Kenneth, A. & Sons Ltd. Montgomeryfield No. 1 P.C.M. 8 Kenneth, A. & Sons Ltd. Shewalton Nos. 1, 2, 3, 4 and 7 P.C.M. 9 Kenneth, A. & Sons Ltd. Shewalton Nos. 5 and 6 P.C.M. 1 Lochwood Coal Co. Ltd. Lochwood Mine P.C.M. 11 Semple, R. & Co. Fortacre P.C.M. 6 Southhook Potteries Ltd. Southhook P.C.M. 2 Walkers (Glasgow) Ltd. Shipmill No 3 P.C.M. 12 Bairds & Dalmellington Ltd. Auchincruive Nos. 4 and 5 P.C.M. 15 Bairds & Dalmellington Ltd. Enterkine Nos. 9 and 10 P.C.M. 14 Bairds & Dalmellington Ltd. Tofts Nos. 1 and 2 P.C.M. 21 Bairds & Dalmellington Ltd. Highhouse P.C.M. 25 Bairds & Dalmellington Ltd. Whitehill P.C.M. 26 Garrallan Brick & Tile Co. Ltd. Garrallan P.C.M. 38 Bairds & Dalmellington Ltd. Houldsworth L.C.G. 36 Bairds & Dalmellington Ltd. Littlemill P.C.M. 28 Polquhairn Coal Co. Ltd. Greenhill P.C.M. 27 Polquhairn Coal Co. Ltd. Polquhairn P.C.M. 24 Moore, A. G. & Co. Ltd. Shieldmains Nos. 6 and 7 P.C.M. 22 and 23 Moore, A. G. & Co. Ltd. Shieldmains Nos. 8, 12 and 14 P.C.M. 44 Bairds & Dalmellington Ltd. Bogton P.C.M. 41 Bairds & Dalmellington Ltd. Chalmerston Nos. 4 and 7 P.C.M. 42 Bairds & Dalmellington Ltd. Pennyvenie Nos. 2, 3 and 5 P.C.M. 43 Bairds & Dalmellington Ltd. Pennyvenie No. 4 P.C.M. 31 New Cumnock Collieries Ltd. Bank No. 1 P.C.M. 32 New Cumnock Collieries Ltd. Bank Nos. 2 and 6 P.C.M. 29 New Cumnock Collieries Ltd. Coalburn P.C.M. 34 New Cumnock Collieries Ltd. Knockshinnoch Castle (new sinking just coming into production) P.C.M. 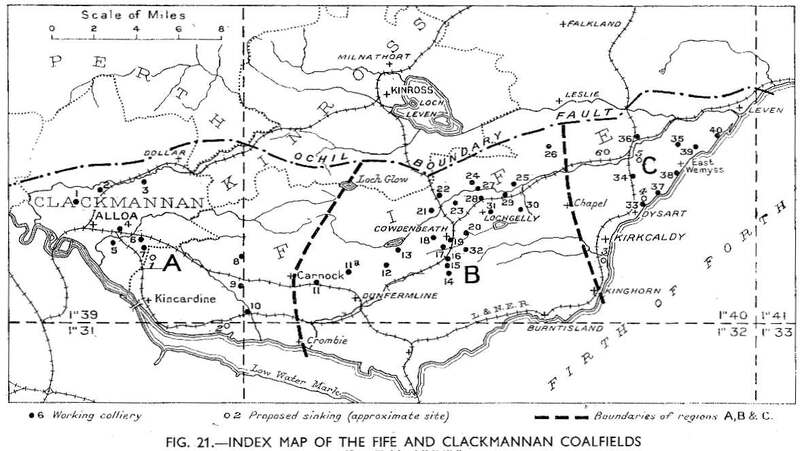 33 New Cumnock Collieries Ltd. Seaforth Nos. 1 and 2 (new sinking just coming into production) P.C.M. 35 Nith Valley Coal Co. Ltd. Bridgend P.C.M. 48 South Ayrshire Collieries (1928) Ltd. Maxwell Mine L.C.G. 47 Bairds & Dalmellington Ltd. Gateside Nos. 4 and 5 P.C.M. 46 Bairds & Dalmellington Ltd. Tower Mine P.C.M.